Virtucom Group's content writing services provide strategic content solutions for numerous industries. All of our content is crafted by a dedicated team of expert writers and editors with the customer's brand in mind. In order to continually grow and evolve your online presence, your website content needs to be fresh, compelling and high quality. Our team of dedicated content writers and editors have experience creating long-term content strategy for numerous industries, and understand the value of high quality, compelling content. Drive natural traffic to your site and establish your company as the industry authority with our business blog writing services. Blogging on a regular basis makes your brand more visible in the eyes of Google, Bing and other search engines while engaging and informing your target audience. Where an optimized business blog funnels traffic to your website, compelling landing pages convert your visitors. Landing page content written by our team of expert writers informs visitors about your business and guides them through the buyer's journey while answering the questions which led them to you in the first place. Keyword-focused landing pages and blog content help potential customers find you in the online space, and targeted location pages will lead them to your brick-and-mortar establishments in the real world. This geo-specific content makes it easy for potential customers to filter out the white noise and drill down to your exact location. Sponsor content articles take a different approach than your blog strategy. Commonly referred to as native advertising, these educational articles let you address issues and their solutions in a more formal manner, essentially positioning your brand as the industry expert. You may not be selling a service with this type of SEO article, but you'll be providing value to your target audience. Not only are they helpful resources for your customer base - ebooks play an integral role in an effective content marketing strategy because they can serve as gated offers on your landing pages and blog posts. When you engage and inform your site visitors as an industry authority should, those visitors are more likely to fill out a form and become leads. Exemplify your industry expertise and bolster your brand's reputation with detailed white papers. These long-form content pieces require extensive research and meticulous fact checking, often incorporating detailed infographics and visuals to provide a wealth of information on a given topic. By educating your customer base, they'll not only be more informed - more importantly, they'll know they can turn to you when they've got questions and need solutions to their problems. Your customers use social media every day to stay connected with friends, family and coworkers, get news and - increasingly - connect with brands, products and services. By maintaining a continually refreshed blog, you not only create more robust site content to show up in search results more often, but also create a repository of blog content for use in sharing on your social media accounts like LinkedIn, Twitter and Facebook. In today's world, your online content is your chance to give potential customers a great first impression. We know this, and that's why our quality is second to none. We're creative content writers who take great pride in our work - we dig deep when it comes to researching your industry, and we get to know your brand persona inside and out. The result? We become an extension of your content team, write in your unique voice and fuel your inbound marketing strategy. Our content editors maintain rigorous standards, ensuring every article, blog post, landing page and press release undergoes our 15-point checklist. 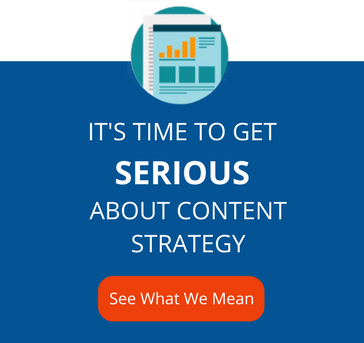 Ready to Get Serious About Content Strategy? We understand that all great content is backed by a great strategy, check out our comprehensive guide to content strategy to see how serious we take our client's business. Ready to Rejuvenate Your Website? Virtucom Group has more than 15 years of experience as a content development agency. We've grown with the content writing industry and have the knowledge, talent and commitment to fuel your inbound marketing with rich, engaging content. We know content outsourcing works, because we've built our reputation on it. Want to speak with someone immediately? Call Dominick at 315-422-3100 x15 to discuss your content needs.